BLANCO’s Premium Matte Inkjet labels for the Primera printers have a white matte finish specially engineered for use in on-demand ink jet printers. It couples good ink jet print quality with fast ink dry time and smudge resistance and is ideal for applications needing to print variable information with full color graphics. Adhesive: general purpose permanent adhesive designed for excellent adhesion to corrugated cardboard and superior adhesion to plastics. This adhesive has excellent initial tack. This product is suitable for use in the Primera LX500 and LX400 printer. Please note: Label media is not interchangeable between the LX400/LX500 and the LX810/LX900/LX2000 Color Label Printers. The LX810, LX900 and LX2000 have a 6” (152mm) maximum diameter on a 3” (76mm) core. 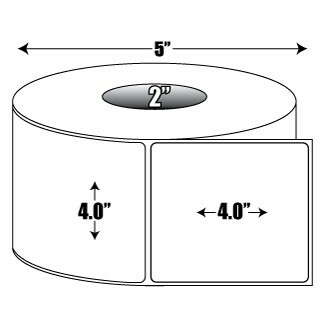 The LX400 and LX500 have a 5” (127mm) maximum diameter on a 2” (50.8mm) core. The standard corner radius is .125”. BLANCO also manufactures this label in a high gloss finish (see related items).